This impressive and secluded 3 bedroom villa has wonderful views of the hillside leading down into Agios Stefanos, and across the sea towards Albania. This quaint Greek village is centred around its attractive beach and harbour, overlooked by numerous shops and tavernas, and can be accessed on foot in around 10 minutes. Villa Kerkyra is a traditional house, with several authentic features and a large private swimming pool. Air conditioning/heating in the bedrooms, WiFi and pool heating are included. A beautiful villa with spectacular coastal views, plus it's only a short walk down to the resort and beach! At the front of the villa is a partially covered terrace which has a large tiled table and a stone BBQ with adjoining wood burning oven. The terrace extends along the side of the villa which has glorious views of the bay, and is bordered with colourful flowers and shrubs. At the end of the terrace, 6 steps lead up to the swimming pool which is surrounded by ample space for you to sunbathe and absorb the picturesque views of the resort and sea. In front of Villa Kerkyra is a small parking area, with double gates under a traditional stone archway opening onto the BBQ terrace. The entrance is straight ahead. The living space is spread over both levels of the villa. On the ground floor is a well-equipped kitchen with a table and chairs. The spacious lounge is on the first floor, and has an impressive ornamental stone fireplace and beamed ceiling, with patio doors opening onto the large upper terrace. The terrace is partially covered and has a table and chairs, where the view over the resort to the open sea is at its best! On the ground floor is a twin bedroom with en suite shower room, a double bedroom and bathroom. Both bedrooms have feature stone walls, plus the double bedroom also has direct access to the side terrace leading to the pool and BBQ area. Upstairs is a second, more traditional double bedroom which has an en suite bathroom, a high beamed ceiling and a wrought iron bed. This villa is registered and licenced by EOT Greek licensing association. This number is: 0829K133K0484901. Villa Kerkyra is in a great position, 10 minutes' walk from the quaint fishing village of Agios Stefanos. The village has a laid-back vibe, and is centred around its attractive little beach and harbour. There are a handful of shops and several seafront tavernas to enjoy. The larger beach at Kerasia, as well as the neighbouring resorts of Kassiopi and Kalami, can all be reached either by car or rental motor boat. Agios Stefanos village is a 10 minute walk down the hill. There are a couple of small mini markets where you can pick up daily essentials, and even order in fresh meat and fish for a BBQ. There's also a few gift and beachwear shops in the village, but serious shoppers should head into Corfu Town which has a popular market and many gift shops, as well as high street brands. Agios Stefanos has a handful of tavernas overlooking the harbour and beachfront, offering a relaxed atmosphere and good food. A 5 minute drive along the coast will bring you to the lovely beachside taverna at Kerasia Beach. Anyone with a car will also be able to visit the neighbouring resorts of Kassiopi and Kalami which have several places to eat and drink. If you prefer not to drive, why not hire a motorboat locally and venture further afield by sea? Agios Stefanos Beach is small but picturesque, ideal for sunbathing, swimming and snorkelling. Any of the tavernas along the seafront are the perfect place to take a break from the heat and enjoy a drink or a spot of lunch. If you fancy a change of scenery, or prefer the buzz of a larger beach, the pebbly bay of Kerasia is only 5 minutes' drive south, also with a good taverna. Plus, if you do choose to hire a motorboat, there are plenty of alternative beaches and coves to explore, which can only be accessed from the sea. There is a choice of waterparks on the island, the nearest being Hydropolis, 30 minutes' drive away in Acharavi. The largest waterpark, Aqualand, is an hours' drive south, right in the middle of the island. The neighbouring resorts of Kassiopi and Kalami, on either side of Agios Stefanos, are well worth seeing. 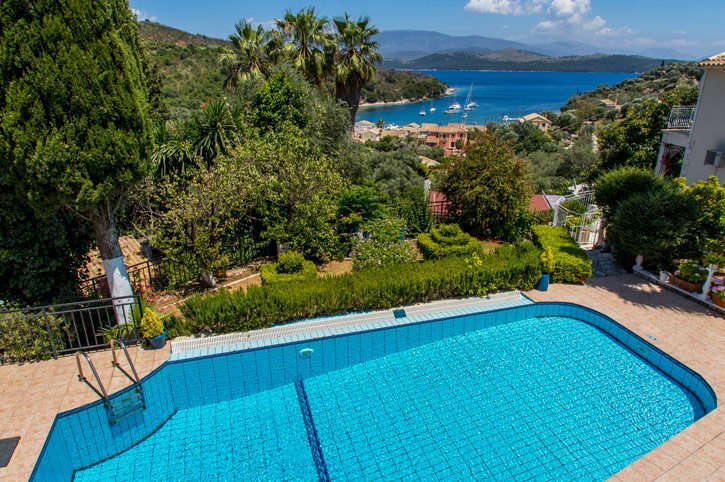 Kalami is a relaxed resort centred around its attractive pebble bay, and is most well-known for the popular White House Taverna, once home to author Gerald Durrell. By contrast, Kassiopi is a much livelier resort with plenty of tavernas and bars around its harbour, all overlooked by the remains of its 15th century castle. The views from Mount Pantokrator and Paleokastritsa are well worth seeing, and no trip to Corfu would be complete without visiting Corfu Town, which you can reach by car or by boat! Corfu's only golf course is an hours' drive away, on the mid-west coast. Many of the islands beaches have water sport facilities. Plus, Corfu is famous for its wonderful scenery and rich countryside, which is best enjoyed either by car, boat or on foot - don't forget your camera! Our reps are on hand to make sure you have a great time. If you need any advice or tips in the local area, they will be more than happy to help. Villa Kerkyra is not available to book for season as it is sold out. Take a look here at the Corfu villas that are currently on sale. Fantastic villa - It's in a great location with lovely views of the bay.